The best home security system won’t protect your most treasured valuables against threats like house fires, flooding, or an accidentally unlocked door. Home security systems aren’t perfect, and a home safe can be the last line of defense against burglars. Here we’ll give you our best home safe reviews, including pros and cons, pricing, sizing, and other tips to help you choose the home safe that best fits your needs. Our top pick for the best home safe is the First Alert 2092DF waterproof fire safe. 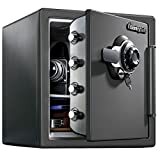 It’s a great all-around safe for just about any type of valuable because it’s equipped with fire- and water-resistant materials and anti-burglary security measures. One of the best features is that you can bolt the First Alert 2092DF safe to your floor without compromising its fire and waterproof resistance. And while it takes up as much space in your house as comparable safes, its 1.3-cubic-foot interior is roomy enough for a small laptop. Waterproof seal and bolt technology keep the safe fire- and water-resistant with the warranty intact after bolting it to the floor. Pry-proof concealed hinges and four live locking door bolts give added security against burglars. 1.31-cubic-foot capacity with a removable and adjustable shelf, key, and door pockets maximize storage space. Backlit digital keypad with emergency override key let you access the safe quickly in an emergency. Our pick for second-best home safe is the SentrySafe SFW123DSB combination fire safe. Its fire and water protection and spacious interior make it a great choice for almost any homeowner. 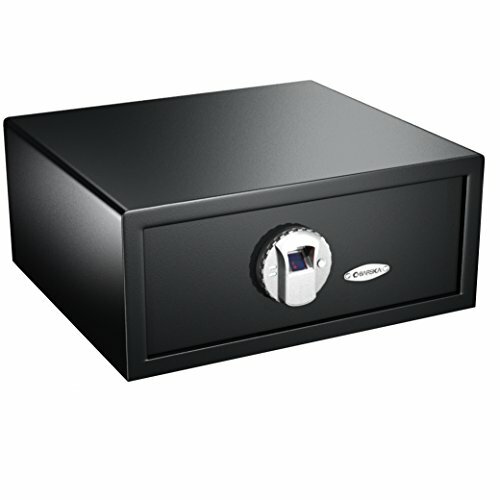 Heavy enough to deter burglars from making a quick getaway, this safe can also bolt to your floor for added safety. However, its fireproof technology causes condensation buildup over time. For that reason, we’d recommend a dehumidifier accessory if you want to store family photos, a small firearm, or video tapes. The interior is large enough to fit an airtight box for such items if needed. 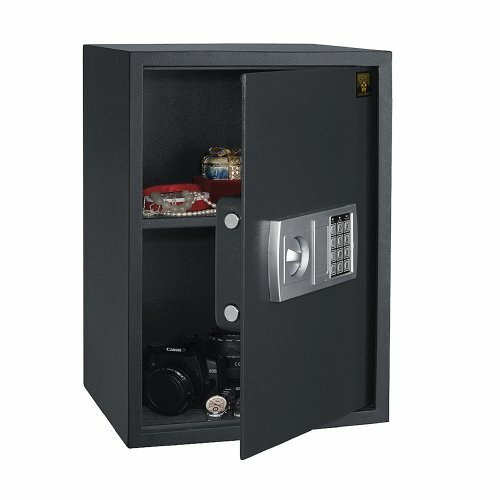 Rounding out our top three picks for best home safe is the Stack-On PS-515 large personal safe. 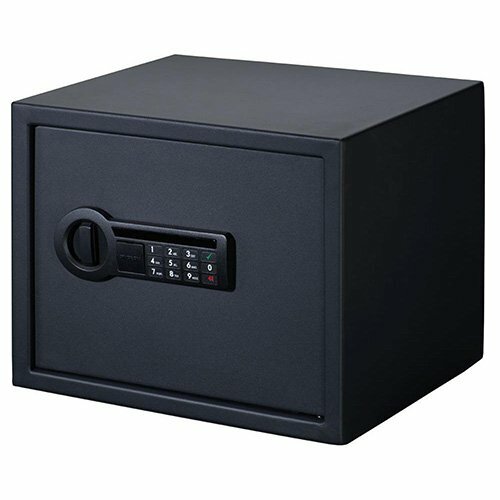 This is a great affordable, medium-sized, theft-proof safe for your home if you’re not looking for fire or water protection. The upside to it not having fire resistance is that there’s less risk of condensation. So it’s a good fit for documents, jewelry, or smaller firearms. The lock times out after three failed attempts, making this a great home security defense to store guns, medication, or other items you need to keep away from your kids. The BARSKA Biometric Safe is a sturdy, reliable small to medium-sized home safe that comes with a lot of good features, including a fingerprint pad for quick access and two backup keys. It also has a silence setting to turn off the beep alert when you open the safe—a feature a lot of customers like but a lot of similar safes don’t offer. The BARSKA is good for storing anything from medication to firearms. The Honeywell 2111 Steel Fire and Security Safe‘s best feature is its fire resistance. Combine that with a reasonable price and seven-year warranty, and this product is worth considering. It’s not packed with features and has no shelves for organization, but the Honeywell 2111 home safe is sturdy and reliable. It’s perfect if a simple safe is all you need. If you’re not looking for fire or water protection, the Paragon Quarter Master 7775 Home Safe could make an excellent choice for your home safe needs. It’s roomy, has a customizable digital code lock, and comes with solid security features. It’s not as heavy as similar fire- andwater-resistant safes, so you’ll want to anchor it to the floor or risk a burglar fleeing with your entire safe in hand. With an impressive 10 =0year warranty, the Paragon 7775 is a solid contender for a reliable burglar-proof home safe. There are three big questions to ask yourself before investing in a home safe (other than the inevitable cost decision). These factors will help you determine the size, type, and features you’ll need. Where will you put your safe? Many people’s first inclination is their master bedroom, but this is one of the first places burglars go. Consider the best hidden area in your home. Go for an out-of-the way place like a spare bedroom or a hall closet. A basement could be also a good option, unless you live in a flood-prone area. 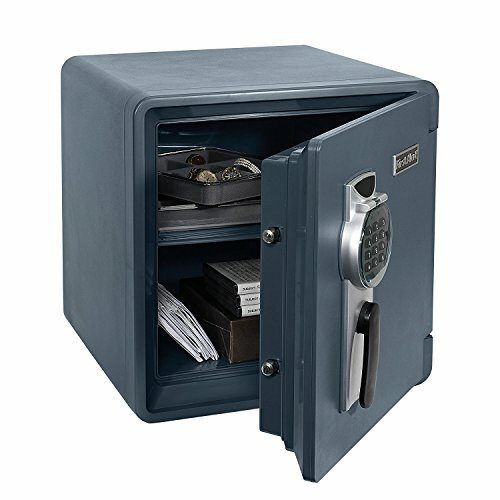 What will you use your safe for? 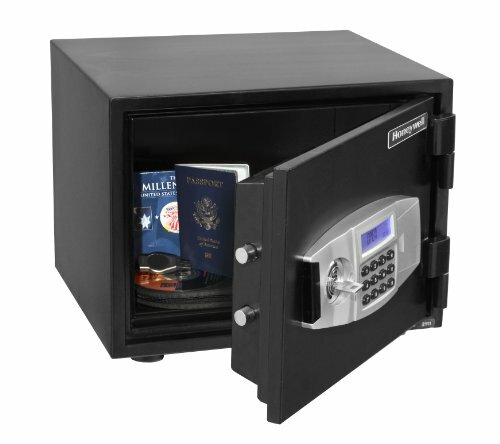 If you plan on storing important documents like birth certificates, stock certificates, wills, passports, etc., you’ll want a fire- and water-resistant safe. If you’re storing jewelry, heirlooms, photo albums, or a small firearm, make sure you find one that has added burglar and safety prevention. Some of the best home safes give you all of these features. Finally, the space you choose and how much you want to store in your safe will determine the size you need. It’s a good idea to go a bit larger than your current needs to give yourself some room for growth. Whether you’re looking to protect documents, jewelry, or firearms, a home safe is your last line of defense against theft and fire and water damage. A home safe is a smart investment for those looking to protect their valuables and their loved ones. Do you have any home safe woes or pros to share?